Ialisos (Trianta) constitutes a place of holiday of the affluent residents of Rodos and as a result the region is characterized by the neoclassical houses and the large mansions with palm trees in their yards. 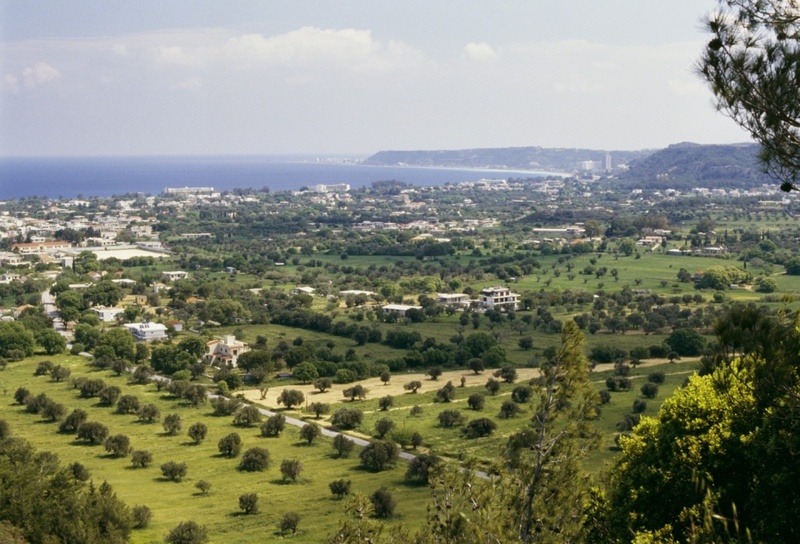 Ialisos is the biggest village of Rodos. The beach - 10 km in length - is one of the windiest in the west side. It is ideal if you are searching a beach that will offer you great waters for swimming, a distinctively beautiful playground is in the center of the beach and of course if you enjoy windsurfing Ialisos beach is like...Hawaii! Ialisos is located in the north-western part of the island, 8 km from the town of Rodos. Visitors can find here many large hotels with high standards and two modern conference centers for organizing and hosting international conferences. What is worth visiting in Ialisos, is the churches of Dormition of Virgin Mary, of St. Nicholas and Zoodohou Pigis. Also the underground Byzantine church of St. George of Hostou with its great frescoes of the 15th century. You can even visit the Filerimo mountain where you can see peacocks walking... with proud beside you, and then take a look at the Knight's monastery with the large cross on the top. Last but not least, the road to Calvary with 134 stairs, on the sides of which carried representations of the Passions of Christ. The area is of significant archaeological interest as it has been inhabited since prehistoric times. In the village Trianta remains of a Minoan settlement and Mycenaean cemeteries have been found in the surrounding hills. The ancient city of Ialysos, one of the three great ancient cities of the island, is the acropolis of ancient monuments, Byzantine and knightly period. It is worth visiting the ruins of the temple of Athena Polias. The characteristics of the rock carvings on the west side, is considered to serve as depositories or dedications for worship. For a relaxing evening, you can choose from the many cafes and restaurants along the coast, or you can visit the shops with souvenirs and famous international brands. DO: Between August-September, enjoy the 'Ialisia'. The program contains elements of Greek traditions with music and dances, and exhibitions of books and paintings. DON'T: The extremely crowded beaches. Find information about selected Hotels, apartments and rooms in Ialisos to choose the perfect place for your accommodation.